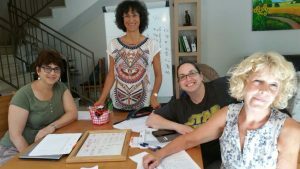 Home/Learn Hebrew/Learning Hebrew in Israel/How to learn Hebrew? Many students ask me by email, How should I study Hebrew? How should I memorize and practice? Why is it so difficult to learn Hebrew? Why students don’t know how to learn Hebrew? It’s not easy to learn Hebrew when you are not surrounded with Hebrew speakers. Without speaking Hebrew aloud, their knowledge is limited to reading and writing. So how can students learn Hebrew? Practice a lot your knowledge in Hebrew . Every time you study new material it is advisable to speak aloud and repeat the new words again and again, as you go through you day: at home, at the office, in your car, and even when you are in the shower. Look for a partner who shares your passion to learn Hebrew and try to speak Hebrew with him as much as you can. Remember, the more you speak aloud, the better you will remember. Practice with the help of questions. Example to questions: Why, how, when, where With the help of the questions you are not only learning by heartת but also trying to understand. This way you will remember better. Practice terms (past present, future) Whenever you learn new verb, you should practice all the terms (if you study them) for the past, present and future. Singular- plural , masculine – feminine Whenever you study new vocabulary, write to yourself all the forms. Practice the structure – the verbs group Whenever you study new verb write to yourself al the forms. I recommend in addition to put the verbs in sentences. In different tenses forms and structures –(groups) As much as you will practice like that, it will not be theoretical and you will find it easier to remember the verbs. Record yourself When you are in front of the written material, record yourself, doing all the suggested exercised before, so you could listen and practice anywhere – in the car, buses, or when you wait on line. As much as you will listen and practice, it will be easier for you to remember.